Having an adequate and clear view during a procedure relies heavily on the most common dental tool you use…the mouth mirror. The reflection of the mouth mirror is important in several ways for performing on a patient, but often times an unknown factor in the professional health of the practitioner. A dim and distorted mouth mirror reflection could bring strain and fatigue to the eyes, which can lead to other uncomfortable symptoms to the body including headaches, a sore neck and shoulders. Eyestrain is something that can be managed rather easily once diagnosed, so if you are experiencing headaches and eye fatigue, you may need to brighten up your vision with a high-definition mouth mirror. If you take a look at the comparison image on the right, you can see how our Crystal HD® mouth mirror lens is significantly brighter than the industry standard Rhodium lens. Having a 40% brighter reflection in itself provides superior vision to your chairside view, and it also reduces the effort needed for your eyes to focus and examine. “… a comparison view [right] of a traditional metal mirror versus the Crystal HD Mirror (Zirc) in the patient’s mouth. Notice the quality of light reflection, clarity, and color accuracy…” – Dr. Lori Trost, DMD. 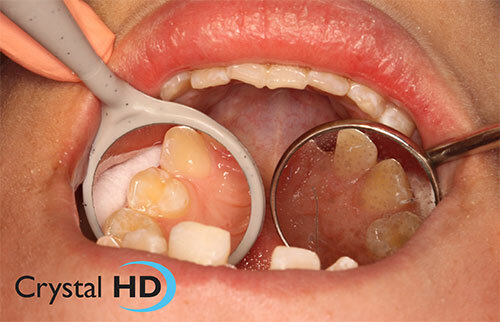 Read Dr. Trost’s write-up on our Crystal HD mouth mirrors here. In a Dental Product Shopper evaluation, our Crystal HD mouth mirrors received a rating of 4.6 out of 5. 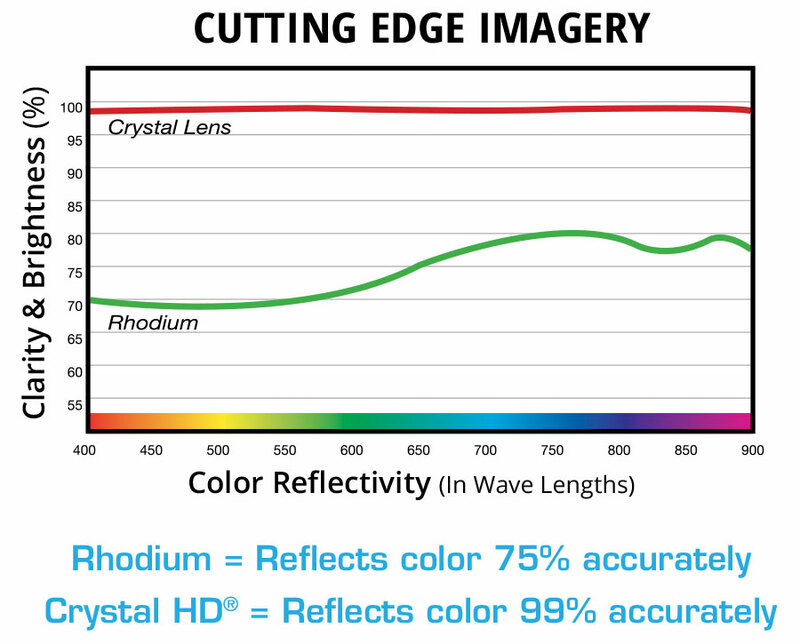 Many of the practitioners in this evaluation support the Crystal HD lens and its superior reflectivity. 7 out of the 11 evaluators rated eyestrain reduction as excellent. There were also several comments on the ergonomics of our lens and handles over stainless steel and how it improved patient care. Read the full product evaluation here. With the brightness and clarity of Crystal HD, you get a 99% true-color reflection, making your color matching effortless while providinga quality product to the patient. Dr. Andrew Goldsmith is a Crystal HD user and enjoys the true-color quality for restorative, “Considering that caries is often in the brown-orange wavelength, diagnosis of decay using the standard Rhodium mouth mirror is more difficult when compared to the exceptional color accuracy of the Crystal HD lens…With the Zirc Crystal HD mirror you can more precisely determine shades of enamel and dentin in restorative procedures”. Patient comfort at chairside is also improved when using our resin mouth mirrors. They eliminate galvanic shock and provide a warm and more comfortable feel to the patient’s mouth compared to stainless steel. The colors and soft features of our resin mouth mirrors bring a more inviting experience to patients of all ages. Being a manufacturer, Zirc is able to control the material make up of our resin products, allowing us to tailor their characteristics to accommodate the dental industry. We incorporate antimicrobial compounds during the manufacturing process along with heat-resistant materials, making our resin products last just as long as stainless steel. The design of our resin mirror heads and one-piece mirrors is unique to the market. We are able to offer a flush surface where the lens the mirror frame meet, so there is no corrosion or debris buildup compared to the gap found in stainless steel mirror heads. No more cotton fuzz or extra debris cleaning needed when using our resin mouth mirrors. Another advantage to our resin products is our ability to utilize color coding for dental procedures. You can utilize our resin mouth mirrors to identify you, the practitioner (Blue = Dr. Smith), or have a designated color for each type of procedure performed, with a corresponding color mouth mirror for each procedure (Blue = Composite procedure). You can learn more about our color coding method, organizers and its benefits here. Our Crystal HD mouth mirror line offers this brilliant lens in several ergonomic and unique styles. Screw-on metal and resin heads are available that fit your favorite handle, and we offer our own light-weight and durable resin handles as well. One of our most popular and ergonomic styles is our Soft Grip One-Piece. This style provides a soft, light-weight handle and is available in a large array of colors. See the full line of our dental mouth mirrors on our website here. © 2003-2017 Zirc. All rights reserved.